I have a coworker who has a good-size garden. Every so often he will bring in extra herbs and vegetables to work. I truly appreciate this as my green thumb has brown edges, just like a drying herb would have. A few people took some of the sage, however, there was basically a box left over. I took home what no one wanted. I was excited. I planned on using some of the sage when I baked some bread. The rest I was going to dehydrate. 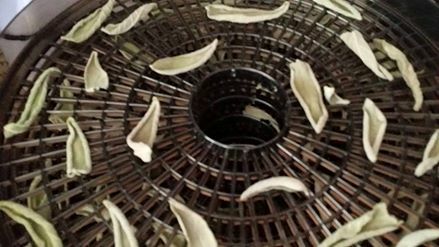 Yesterday morning, I set up the dehydrator and began the task of separating the leaves from their stems After that was accomplished, I laid the leaves in a circular pattern on the trays. 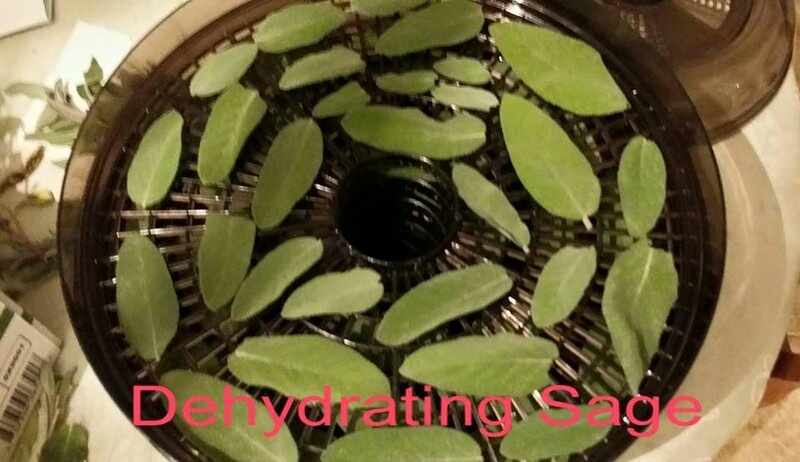 Considering I picked up my dehydrator for $5.00, two years ago, at a garage sale, I couldn’t be happier. Over the last couple of years, I have been removing chemicals from my life, my home and my food. It’s a lengthy process and one many people balk at. They either think making your own products is time consuming or they cannot get past the commercialism that has surrounded their entire existence and they think purchasing pre-made items is the only option. While I can’t remove 100% of chemicals from my life (I’ll never stop dying my hair – grey is not an option lol), I can do my part to minimize some of them; esp. what I ingest or what goes on my body. That being said, I discovered an AMAZING DIY (Do It Yourself) deodorant that is more effective than anything I’ve tried previously. Believe me, I’m all about testing out recipes before passing them along to friends and now my followers. I made this recipe a couple months ago. It really lasts quite awhile and is easy to use. I will caution, should you choose to add an essential oil, please remember you should store your finished product in a glass container, as essential oils can pull from the plastic it’s held in. I haven’t purchased deodorant in the last couple of years. Yup, I’ve been making it myself for that long and thanks to this deodorant recipe, I have found my favorite! It’s really quite simple; only 3 ingredients. You just need coconut oil, baking soda and arrow root powder (found in the spice aisle). Oddly enough, I use arrow root powder in gluten-free cooking, so I had plenty on hand to try this. I admit, I was a bit skeptical, but I made up a batch, used it right before I took my daughter hiking and it worked like a charm! I simply store mine in a Pampered Chef glass mini measuring bowl with a plastic lid. I use my fingers to apply. Not a big deal. I’m at the sink and just wash my hands. Not to mention, I’m being green by using dishes and not having to throw a container away every so often. So there you have it. Give it a try. I bet you will be pleasantly surprised and odor free! Grateful for intolerance? Who would really be grateful for that? I have yet to do is clarify that statement, which will put the ‘intolerance’ in perspective. For a variety of reasons, I have yet to receive an official diagnosis, but I am someone who cannot consume gluten without paying some pretty severe penalties. I hesitantly say official diagnosis because I am acutely aware of how my body reacts: the pain, the not-so-nice bodily functions that result, the inability to stay awake, the inability to sit up or rest comfortably, the bloating (as in a full pants-size) and a myriad of other symptoms. I know I need to seek out a medical professional to assist in managing my condition, whatever those who “practice” medicine choose to call it. Around this time two years ago, marks when my symptoms peaked. I spent several times in one week, getting up in the middle of the night, going downstairs as to not wake my husband, curled up in the fetal position on the throw rug in the livingroom, literally praying for death through my tears. Not having health insurance meant I had to make a choice to suffer at home or risk thousands of dollars for an emergency room visit they may or may not be successful in removing the torment I suffered from. Seems a bit far-fetched doesn’t it? Yet, countless others know exactly what I am speaking of. Whether it’s a “simple” gluten intolerance or actual Celiac’s Disease, it’s not a fad, it’s not made up, it’s not a weight-loss gimmick. It’s real! I never considered a simple protein could cause such discomfort and pain. It wasn’t until a friend knew of my suffering suggested I try to go gluten-free for two weeks. I was literally ready to try anything. Luckily, this option was painless and didn’t require lots of money to try. Two weeks went by and my symptoms weren’t gone, but the debilitating pain was. I took to making an honest, gluten-free effort, in my eating habits. While it meant reading more labels, it wasn’t a big deal to me. I was a vegetarian for nine years. I was a label-reading-holic. It was second nature. Two years later, I am still as gluten-free as possible. I’ve lost and kept off 40 lbs. I once read a weight loss article regarding sacks of potatoes and using them a reference for losing 10-lbs. If you’ve lost 10-lbs, you’ll have a decent, physical representation of what was on your body. Try looking at four of those bad-boys. I was secretly impressed with this “side effect”. Is maintaining a gluten-free diet easy? Yes and no. It has helped me continue my quest in eating better. It affords me the opportunity to make even more homemade dishes; not just for me but my family as well. I eat less processed foods than ever before. I can’t really say that’s a bad thing either. Granted, my food bill has gone up, esp. where alternative flours are concerned or buying something pre-made that is gluten-free. It can be frustrating when I want something “quick” to eat and I can’t just grab a cookie. Please don’t suggest a piece of fruit or a salad. Believe me, I get more than enough of those foods. Over all, I am grateful for my intolerance or perhaps, disease. I will work on getting that official diagnosis. As you know, I have issues with the medical community and need to find the right doctor who actually understands my symptoms and treatments. I don’t need “I don’t knows”. I need a doctor who can see the long-term goal of managing my food-related journey so I remain as symptom-free as possible. You now have a glimpse inside the gluten-intolerance world. I have spared you the really gross details with a glossed-over version. I think it’s best for all concerned. After all, some of you could be eating while reading this. Please remember, the majority of us with intolerance or Celiac’s aren’t being difficult in restaurants. Just because we don’t go into anaphylactic shock upon ingestion of a bagel or piece of bread, doesn’t mean we won’t be sick after we get home (if we make it home before symptoms set in). Please be tolerant in that regard. I’m not as grateful for public intolerance for an issue they are typically clueless about.